The second edition of HVACR Careers Fair, a unique meeting platform converging prospective Heating, Ventilation, Air Conditioning and Refrigeration (HVACR) employers and industry professionals from across the region, will be co-located this year with Climate Abu Dhabi, an exhibition dedicated to the HVACR industry set to take place from 3 to 5 October at the Abu Dhabi National Exhibition Centre (ADNEC). Organised by Careersbay.com, the only specialised HVACR-related recruitment company in the region. HVACR Careers Fair will serve as a platform for jobseekers and students in the UAE to connect with the region's leading HVACR companies including large multinationals (MNCs) and homegrown SMEs. In addition to facilitating face-to-face networking and meetings between potential employers and employees, the event will allow participants to exchange information and share knowledge about the HVACR job market, challenges and opportunities in the field. Alissa Paille, Founder of Careersbay.com, organizer of HVACR Careers Fair, said: "As the only specialised HVACR recruitment and headhunting entity in the UAE, we are thrilled to provide a focused meeting platform between employers and industry professionals this year through our collaboration with the organisers of Climate Abu Dhabi. Unlike other industries, HVACR continues to witness a strong recruitment activity this year, and the fair will prepare the ground for further human capital investment in this area. With already more than 3,000 pre-registered visitors for the exhibition, we expect a strong turnout during the event." Omar Mudassar, Project Manager, Climate Abu Dhabi, said: "The co-location of Climate Abu Dhabi and HVACR Careers Fair will create a robust platform to support HVACR industry and accelerate job creation in this arena. Given the current economic situation, the HVACR industry is seeing a slow but steady growth. As one of the most important industries in the region, numerous employment opportunities are available for qualified candidates in HVACR industry. 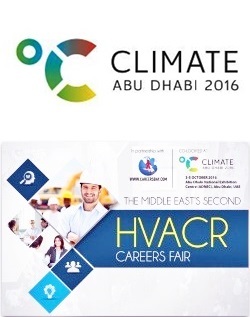 In collaborating with HVACR Careers Fair, Climate Abu Dhabi will support the domestic and international companies attending the event to identify local talents required to fill the vacancies arising from their expansion in the MENA market." Antoine Georges, Managing Director, Dome Exhibitions, said: "The synergy between Climate Abu Dhabi and HVACR Careers Fair will create a perfect opportunity for job seekers to interact effectively with prospective employers from a broad spectrum of sectors. In addition, it will help employers reduce the cost of recruitment by finding the right people with the right skills, while helping job-seekers gain a better understanding of the current and future job market requirements." Aimed at initiating dialogue about the new range of eco-friendly products and solutions available within the climate and cold chain sector, Climate Abu Dhabi 2016 is the latest initiative by the emirate of Abu Dhabi to highlight energy efficiency and environment sustainability. Revolving around three themes of indoor climate (HVAC), process cooling and cold chain technology, the exhibition will spotlight cutting-edge innovations that make a difference in achieving energy efficiency, indoor air quality, food safety and connectivity. The inaugural edition of the exhibition will draw the participation of over 5,000 industry specialists as well as high-level decision makers and experts from world leading industry associations including Air Conditioning and Refrigeration Manufacturer's Association (ISKID) in Turkey and Eurovent, Europe's leading industry association for Indoor Climate (HVAC), Process Cooling, and Food Cold Chain Technologies. The event is organised by Dome Exhibitions and Euroexpo, and will draw the support of ADNEC, Climate Control ME, ASHRAE, EUROVENT, ISKID, Abu Dhabi Quality & Conformity Council, Federation of UAE Chamber of Commerce and Industry, and AbuDhabiEvents.ae as key partners.